Whether you’re entertaining around your fireplace during the winter or using a fire pit outside with the warmer weather, there’s no doubt that a toasty fire adds ambiance to any get together. Fires take the chill out of the air and make us feel sociable. However, anytime there is an open flame, you need to take precautions and be sure everyone in your home understands the hazards and how to avoid home fires. Whenever there is a fire, be sure there is an adult present at all times. One spark is all it takes to transform a benign and cozy fire to a raging, life-threatening blaze. If you’re using a fire pit, it should be placed at least 10 feet from any structure. Don’t use fire pits on windy nights as sparks and embers can be blown much farther than under normal conditions. Have a fire extinguisher handy and make sure it is easily accessible. If you’re outside, have your hose hooked up so in a worse-case scenario, someone can quickly douse the fire. Keep people, pets and objects away from the fire. Once the party is over, cleaning out ashes from your fireplace or scraping ashes out of your fire pit seems harmless enough. The fire’s gone, what could possibly go wrong? Even if they’re no longer smoldering, ashes retain heat and should never be disposed of in paper, plastic or cardboard containers. 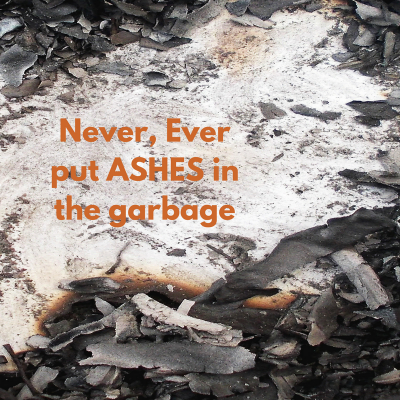 Never dump all of the ashes at once because even slightly warm ashes, when compacted, can reignite. Ashes should always be placed in a metal container and soaked with water. Only when you have confirmed the ashes are downright cold, should you spread them on your garden or gravel driveway. Don’t keep the metal container near other flammables such as your propane tank, near your home or in your garage.